THE LAUNDRY MONSTER! You will NEVER escape me! Sure, you may contain me for a day or two, but I am ALWAYS here, lingering, waiting, building up every hour and ready to attack your weekend! Bwah ha ha ha ha! 🙂 Thanks! Thanks for reading. Seriously don’t know how you do it. Also, you need an upstairs laundry room! Ha! Funny you should mention that. 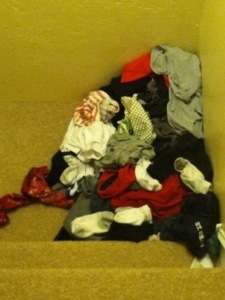 I actually opted out of the upstairs laundry and PAID EXTRA to have the laundry put in the basement. Dumbest. Move. Ever. Be easy on the laundry monster. It lives a complicated life. It goes through cycles and sometimes it gets a little out of balance. It regularly gives up something for lint. Sometimes, it’s just a basket case. Can I reblog your comment? Does wordpress allow that? Be it known: Jess has permission to re-use, bend, fold, mutilate my comments as she sees fit. Ha! Face, arms, scales and teeth. It’s all there somewhere. Then it needs to be folded. Blech! It never goes away! Not even when you’re old. Please tell me it slows down though! Ha! It IS a nemesis! I’m glad you can defeat the evil monster with your good superhero-ness. It just keeps coming though.